*Katharina Frei* - Kreatives Sammelsurium: WoJ preview #5 - Just to slay ThankYou! WoJ preview #5 - Just to slay ThankYou! Oh what a day!! We had a lot of snow over night andthe kids and I decided to visit a friend to play in the garden. We had a lot of fun until Noel (my 16 month old son) hit his head on a copped stone. Blood everywhere... I had to go to the hospital with him, but he was such a brave little guy! He feels alright and is taking a nap tight now, but I still have trembling knees. Was für ein Tag!! Bei uns hat es über Nacht stark geschneit also kamen meine Jungs und ich auf die Idee eine Freundin besuchen zu gehen um dort im Garten zu spielen. Wir hatten auch viel Spaß bis sich Noel (mein 16 Monate alter Sohn) die Stirn an einem spitzen Stein aufgeschlagen hat. Überall Blut... Ich mußte mit ihm ins Spital wo sie es geklebt haben. Er war so tapfer :) Ihm geht es gut und er macht gerade sein Mittagsschläfchen, aber mir zittern immer noch die Knie. Here is my last preview of the new Whiff of Joy Medieval collection designed by Alison Acton which will be released tonight at 0:00 (GMT +1, there is a clock in my sidebar). The sentiment is computer generated. Thanks so much Fran, for all the fabulous ideas!! I coloured Knight Charlie with Copic Sketch Markers (the image below show which colours I used). The background was done with Stampin' Up pastels (close to cocoa and chocolate chip). Ich habe Ritter Charlie mit Copic Sketch Markers coloriert (das Bild unten zeigt euch welche Farben ich verwendet habe). Den Hintergrund habe ich mit Stampin' Up pastels (chocolate chip und close to cocoa) gewischt. Don't forget about the High Hopes Hullaballoo. The following Divas are showing previews of the stamps that will be released in sunday: Crissy, Kimmie, Jeanne, Diana, Nikki. The High Hopes Guest Designer Call is still open!! Lovely card Katharina, as always !! Oh I am so glad Noel is okay dear. I know that had to be a nightmare. Your card is just lovely dear such gorgeous images you have coming out dear. Oh wie süß. Das ist ja auch ein tolles Motiv! OH my I hope Noel is ok.. and no headache today. 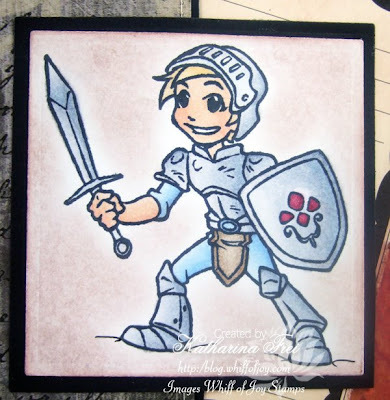 Your knight is wonderful, love him! and the sentiment is great! Poor wee boy. Hope he is on the mend. Your card is beautiful as always. Glad to hear your little boy is ok,its always more of a fright to the parents than the children. I hoep Noel is ok, man I'd be freakd out too, but he's a little boy and they are so resiliant!! 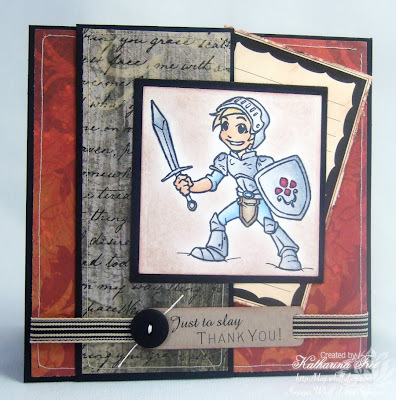 Another fabulous card Katharina, great release!! Beautiful card!! I can't wait for my new stamps to get here!!! A fantastic card too Katharina! This is so awesome! I have really been enjoying the sneak peaks. This is a fun release.